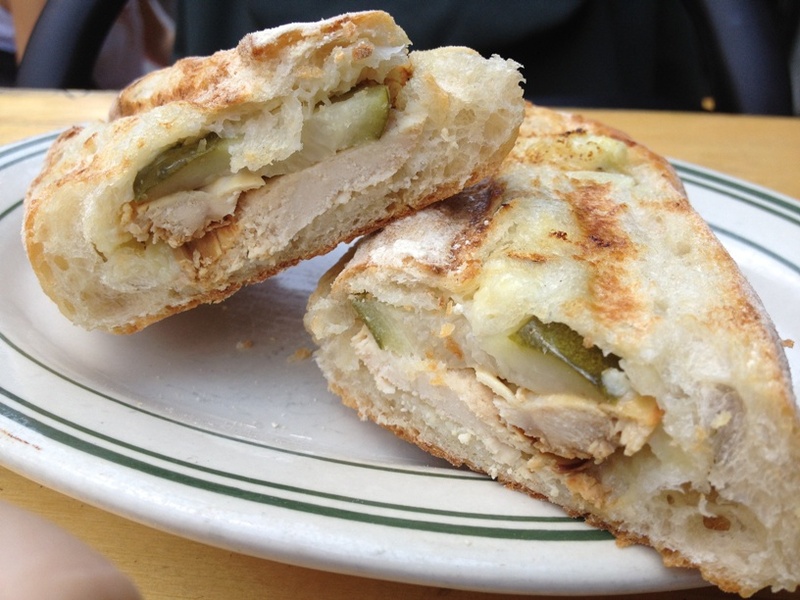 White meat chicken breast finally has a raison d’etre and it’s name is the Lebanese Pressed Chicken Sandwich ($10) at Porchetta. Just when you thought things couldn’t get any better at the porcine palace, Chef Sara Jenkins had to go and follow through on all the Lebanese food talk and create what is quite possibly the tastiest chicken sandwich I’ve had in a long time. The same airy Grandaisy Ciabatta Piccola that sandwiches the namesake porchetta is slathered with a Lebanese garlic and lemon sauce called “toum” and packed with house made pickles and sliced white meat chicken marinated in lemon, saffron and onions, all before crisping up in the sandwich press. The best bites are those where the toum surprises your taste buds, a pool of it exploding from an airy nook in the ciabatta. At first glance, the finished product doesn’t inspire much awe. You may even feel like you should ask for extra toum. But looks are deceiving; there is so much flavor among the toum, marinated chicken and crisp pickles, you won’t want more sauce, you’ll want another sandwich. Only once before have I experienced chicken, garlic and lemon converging so beautifully, and it was out at Alsalam Restaurant & Meat Market in Bay Ridge, Brooklyn, where the chicken schwarma is well worth the trip. Chef Jenkins drew inspiration for the sandwich from childhood trips to Lebanon; all you have to do is go to the East Village. Make it happen soon, the chicken sandwich is only here for the summer. IS there a simple Toum recipe anywhere? Want to try – thanks NYCFG! I haven’t tried it but sounds about right and definitely worth a try! You have done it again. Damn, forced me to look up from my desk and glance at the clock. Christ, it’s lunch time. I’m going to slip on a pair of shoes and have lunch. Really a beautiful description of a simple offering, but one that explains our passion for a well prepared meal…and the joys of simplicity. I’m away until the 11th. Let’s break break soon after. yet another sandwich i must try. thanks for the info! The Lebanese Chicken Sandwich was good. Not especially good, good. The chicken moist, nicely seasoned (although I think a dark meat would have improved the experience); the Ciabatta Piccola, nicely toasted. I suppose what left me less than enthusiastic was that my sandwich was not slathered with toum. One might accuse the sandwich man of sprinkling it on—so the much anticipated “explosion,” was, in a word, a dud. That said, for a light repast, it was good and certainly if I’m on 7th and between meals, a place to stop. All said and done, Porchetta is not a place I would go out of my way for again. Nevertheless, thank you for the tip. What I’d like to do is spend a little time in Bay Ridge and do the real thing. This was really good but try also Balade restaurant (Lebanese cuisine) and their Toum=Garlic is delicious, real authentic lebanese food.